MOSCOW, September 3. /TASS/. 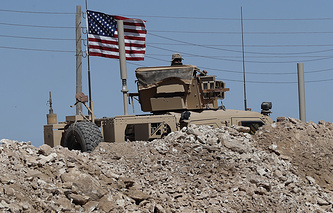 The looming assault on Syria that the US-led coalition intends to carry out will not affect plans to liberate Idlib, Syrian Foreign Minister Walid Muallem told the Rossiya-24 TV channel. "The intended aggression won’t affect our people’s morale nor will it sway our military plans to liberate Idlib," he said. "This is not the first time that the United States, Great Britain and France have cooked up a scheme for a chemical weapons incident. It happened earlier in the Damascus suburb of Douma, when these countries decided not to wait for the results of an international investigation and conducted a trilateral strike on Syria. However, the Syrian people manned up to and scoffed off that aggression. They celebrated as they watched Syrian rockets down missiles launched by the aggressors," Muallem pointed out. According to him, the entire international community is already aware of the flimsy excuse for the imminent aggression against Syria. "They [the US and its allies] are providing the White Helmets with tools to stage a false flag chemical weapons incident and shoot it in a village in the Idlib province," the Syrian top diplomat said, adding,"this video footage is planned to be used as an excuse for a future act of aggression."